✔️ Mold problems or questions? ✔️ Dealing with a little mold? Or a lot of mold? We can help! ✔️ We always give free consultations and free quotes. ✔️ Expert staff & advanced technology. ✔️ We work with homeowners and business owners. "Everything. The people were great. Excellent customer service." "I have hired your company on two occasions and have been extremely pleased with the thoroughness of the job and the friendly and professional service." "Great customer service, the problem was dealt with and was happy with the service and cost." "Seemed knowledgeable and were very accommodating." "Immediate availability to address our problem. Very professional. Great follow through and follow up. Everyone easy to work with and reach by phone. Clean, organized, and efficient. Knowledgeable about problem AND resolution thereof. Made it possible for me to deal with other issues knowing they were on top of this. AND VERY RESPECTFUL of our house and our things. Thank you." "On time, professional, thorough, very pleasant people." "Work was done well and quickly. You guys are my go-to group for cleaning, and in the most recent situation was mold remediation in the garage." Identify the source of the problem. Mold grows where there is moisture, if you do not take care of the moisture problem you have not taken care of the mold problem. ServiceMaster will help you find and fix the problem at the source, not just cover up the evidence. Use proper tools and cleaning agents to make sure you are not spreading mold spores as you clean up the mold. ServiceMaster has the correct tools and processes to properly contain the mold pores as the mold is being removed. Remove the affected areas. 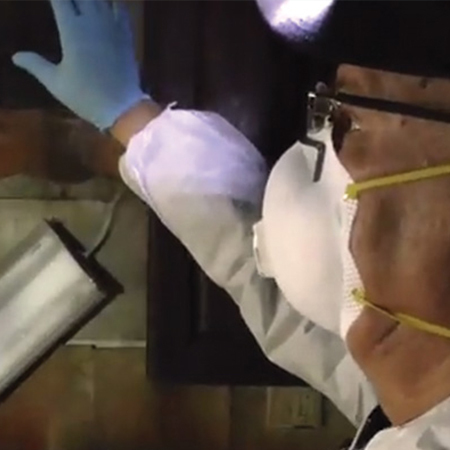 ServiceMaster follows specific recommendations and best practices for mold removal. If mold affects more than 10 square feet then removal of the affected areas and testing is recommended. but don’t prey on your fears about mold. Mold can be a serious problem and should not be treated lightly. While figuring out what next step to take, remember there is a lot of misinformation about mold. We take mold seriously but don’t prey on fears about mold. Some of the misinformation allows companies to take advantage of the situation and perform unnecessary, costly services that may or may not address the problem. ServiceMaster of Kalamazoo works hard to stay up-to-date on industry best practices for dealing with mold as well as the local and state government regulations detailing mold remediation requirements. Can't I just use bleach to get rid of the mold? Some of the misinformation allows companies to take advantage of the situation and perform unnecessary, costly services that may or may not address the problem. Many people think spraying mold with bleach is enough to eliminate their mold problem. This is not the case. Bleach may kill some molds on some kinds of material, but it has not been shown to kill all molds. Bleach is not effective at killing molds on porous surfaces. But even if you can “kill mold” it is not enough to “kill it” and forget it. Dead mold still contains allergens and causes health problems. To properly get rid of mold you must have it remediated. Why call ServiceMaster of Kalamazoo first? We always give free consultations, and we can help you wade through the next steps. We’ll cover mold remediation procedures and best practices, dispelling myths about mold and how to clean it up. Mold can be a serious problem. If left unresolved, mold can spread quickly and cause potential health issues and damage in your dwelling. But still keep in mind, there is a lot of misinformation about mold and its health effects. Unfortunately, we don’t add our pricing online. Each job is unique and could range in hundreds of dollars. We give an accurate analysis of your situation so we can give accurate quotes.